This deadly fiu spread quickly around the world, infecting hundreds of millions of people and killing 50 to 100 million (upwards of 5% of the world's population). Every year, flu viruses make people sick. Even a garden-variety flu may kill people, but usually only the very young or the very old. 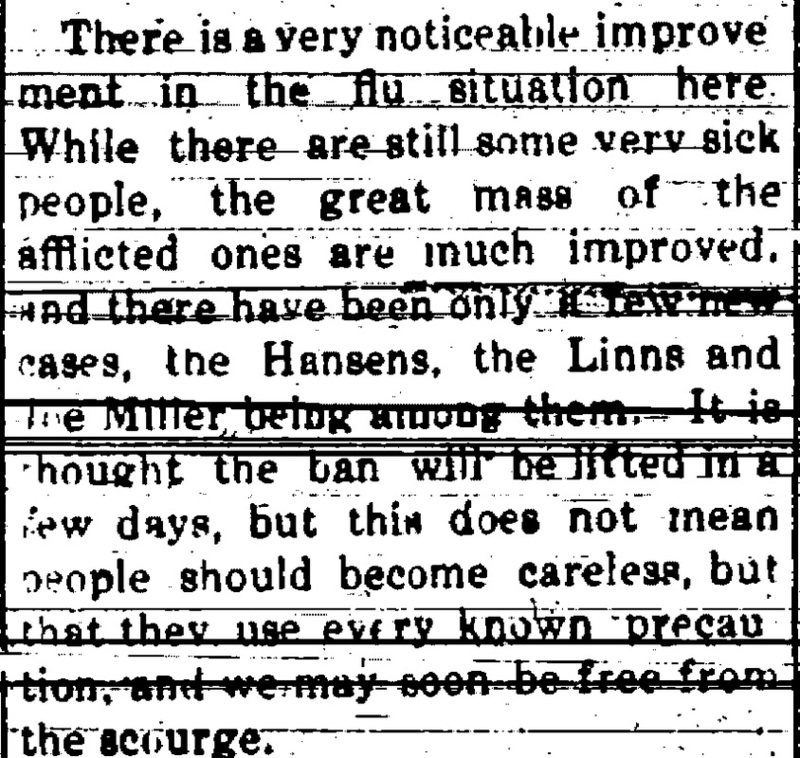 In 1918, the flu mutated into something much more virulent. This new, deadlier flu acted very strangely; it seemed to target the young and healthy, being particularly deadly to 20 to 35 year olds. In three waves from March 1918 to the Spring of 1919, this deadly flu spread quickly around the world, infecting hundreds of millions of people and killing 50 million to 100 million (upwards of 5% of the world's population). Also Known As: influenza, grippe, Spanish Lady, the three-day fever, purulent bronchitis, sandfly fever, Blitz Katarrh. No one is quite sure exactly where the Spanish flu first struck. Some researchers have pointed to origins in China, while others have traced it back to a small town in Kansas. The best recorded first case occurred in Fort Riley. Fort Riley was a military outpost in Kansas where new recruits were trained before being sent to Europe to fight in World War I. On March 11, 1918, Private Albert Gitchell, a company cook, came down with symptoms that at first appeared to be a bad cold. Gitchell went to the infirmary and was isolated. Within an hour, several additional soldiers had come down with the same symptoms and were also isolated. Despite the attempt to isolate those with symptoms, this extremely contagious flu quickly spread through Fort Riley. After five weeks, 1,127 soldiers at Fort Riley had been stricken with the Spanish flu; 46 of them had died. 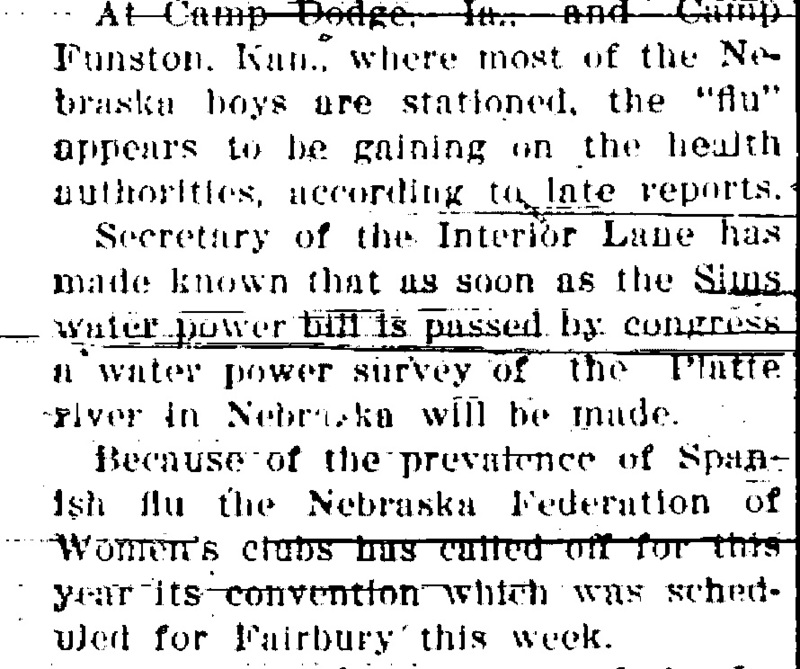 Soon, reports of the same flu were noted in other military camps around the United States. Shortly thereafter, the flu infected soldiers on board transport ships. Although it was unintended, American troops brought this new flu with them to Europe. Beginning in mid-May, the flu started to strike French soldiers as well. The flu traveled across Europe, infecting people in nearly every country. When the flu rampaged through Spain, the Spanish government publicly announced the epidemic. 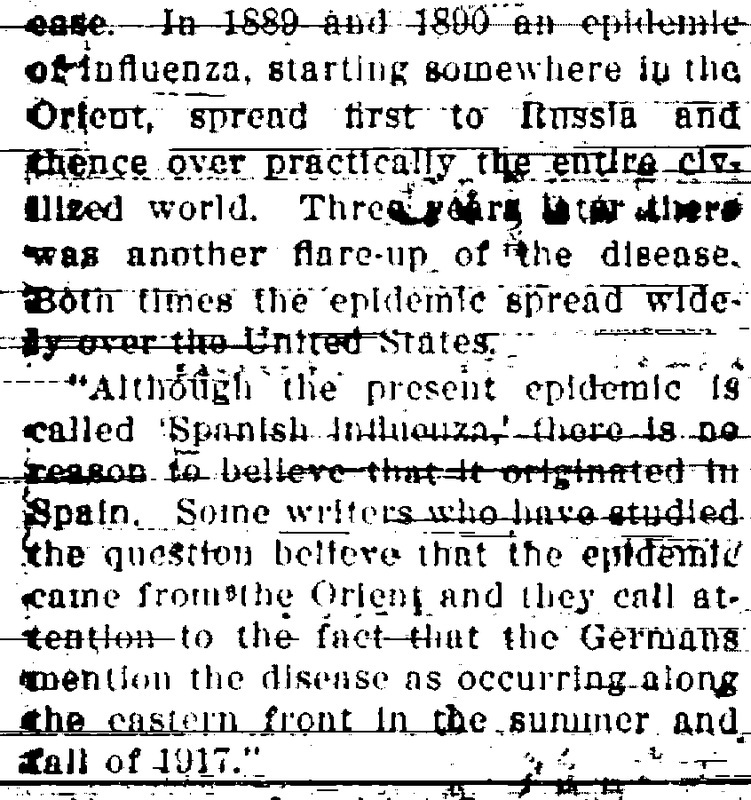 Spain was the first country to be struck by the flu that was not involved in World War I; thus, it was the first country not to censor their health reports. Since most people first heard about the flu from its attack on Spain, the new flu was named the Spanish flu. The Spanish flu then spread to Russia, India, China, and Africa. By the end of July 1918, after having infected people all around the world, this first wave of the Spanish flu appeared to be dying out. In late August 1918, the second wave of the Spanish flu struck three port cities at nearly the same time. These cities (Boston, United States; Brest, France; and Freetown, Sierra Leone) all felt the lethalness of this new mutation immediately. Hospitals quickly became overwhelmed by the sheer numbers of patients. When hospitals filled up, tent hospitals were erected on lawns. Nurses and doctors were already in short supply because so many of them had gone to Europe to help with the war effort. Desperately needing help, hospitals asked for volunteers. Knowing they were risking their own lives by helping these contagious victims, many people, especially women, signed up anyway to help as best they could. The victims of the 1918 Spanish flu suffered greatly. Within hours of feeling the first symptoms of extreme fatigue, fever, and headache, victims would start turning blue. Sometimes the blue color became so pronounced that it was difficult to determine a patient's original skin color. The patients would cough with such force that some even tore their abdominal muscles. Foamy blood exited from their mouths and noses. A few bled from their ears. Some vomited; others became incontinent. The Spanish flu struck so suddenly and severely that many of its victims died within hours of coming down with their first symptom. Some died a day or two after realizing they were sick. 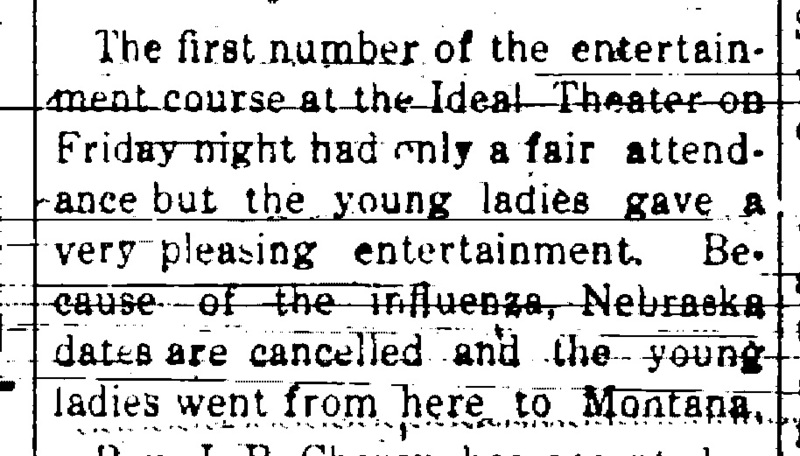 Not surprisingly, the severity of the Spanish flu was alarming. People around the world worried about getting it. Some cities ordered everyone to wear masks. Spitting and coughing in public was prohibited. Schools and theaters were closed. People also tried their own homemade prevention remedies, such as eating raw onions, keeping a potato in their pocket, or wearing a bag of camphor around their neck. None of these things stemmed the onslaught of the Spanish flu's deadly second wave. PILES OF DEAD BODIES The number of bodies from the victims of the Spanish flu quickly outnumbered the available resources to deal with them. Morgues were forced to stack bodies like cordwood in the corridors. There weren't enough coffins for all the bodies, nor were there enough people to dig individual graves. In many places, mass graves were dug to free the towns and cities of the masses of rotting corpses. On November 11, 1918, an armistice brought an end to World War I. People around the world celebrated the end of this "total war" and felt jubilant that perhaps they were free from the deaths caused by both war and flu. However, as people hit the streets, gave kisses and hugs to returning soldiers, they also started a third wave of the Spanish flu. The third wave of the Spanish flu was not as deadly as the second wave, but still deadlier than the first. Although this third wave also went around the world, killing many of its victims, it received much less attention. People were ready to start their lives over again after the war; they were no longer interested in hearing about or fearing a deadly flu. GONE BUT NOT FORGOTTEN The third wave lingered. 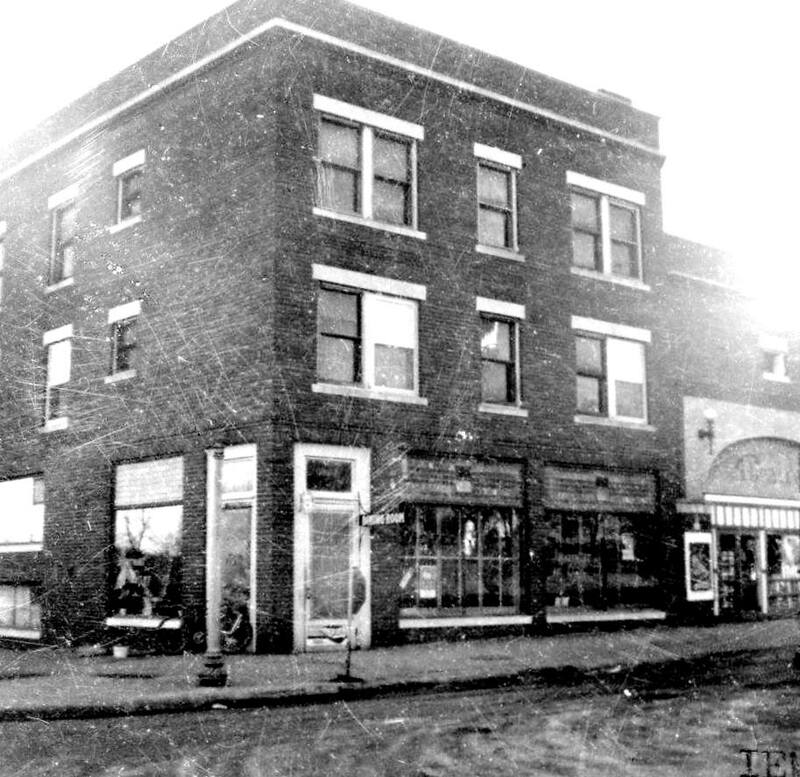 Some say it ended in the spring of 1919, while others believe it continued to claim victims through 1920. Eventually, however, this deadly strain of the flu disappeared. To this day, no one knows why the flu virus suddenly mutated into such a deadly form. Nor do they know how to prevent it from happening again. Scientists and researchers continue to research and learn about the 1918 Spanish flu in the hopes of being able to prevent another worldwide pandemic of the flu. The pandemic must have seemed far away, and not a source of great worry if one need only ensure plenty of ventilation when sleeping and avoid constipation and other such "simple" rules to accomplish having the disease "soon" stopped. 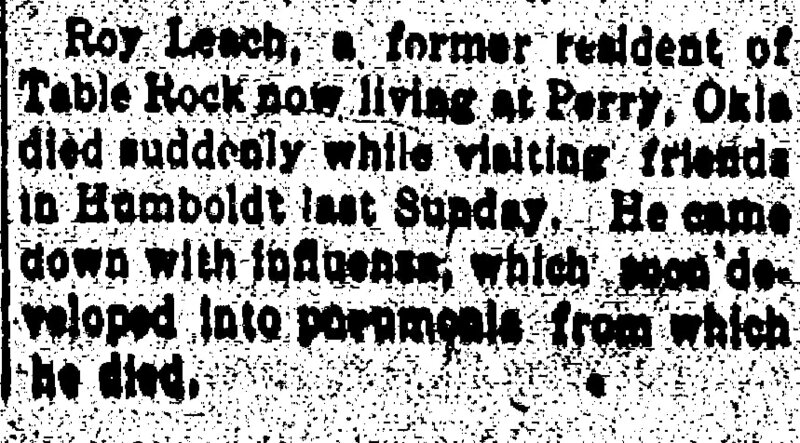 Yet buried elsewhere in the social pages was a note about the first Table Rock-related death, that of Roy Leech. 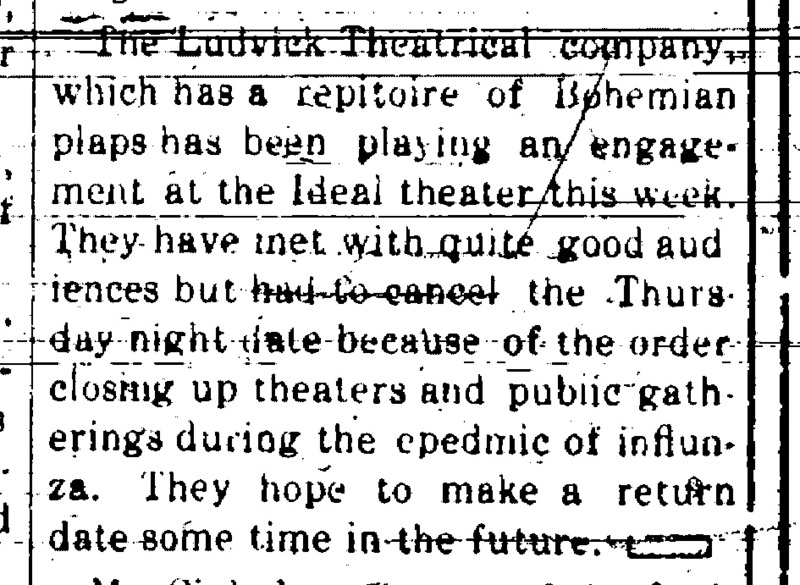 The Ideal theater in 1918. The remaining paragraph of the article is illegible. The widow, Eva Main, took her husband's body back to his old home. 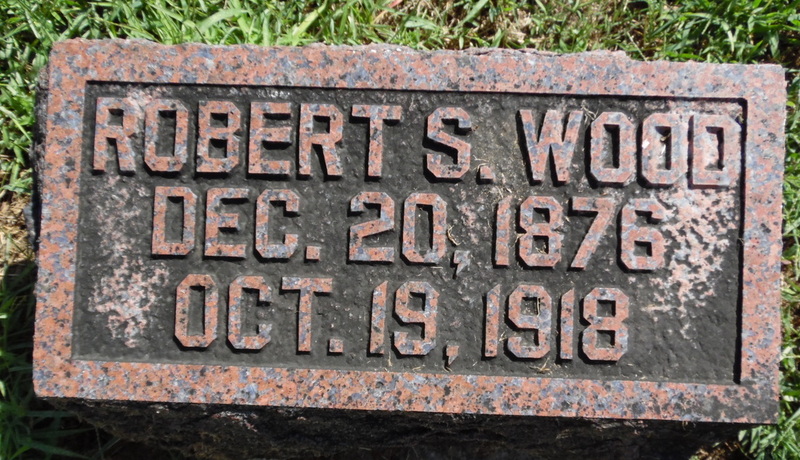 He is buried in Lakeview Cemetery in Spirit Lake, Iowa. 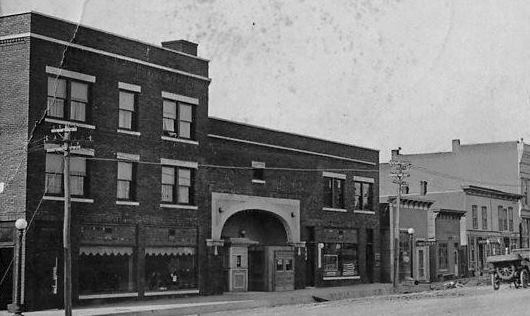 The Lincoln Hotel in the 1940s, virtually unchanged. 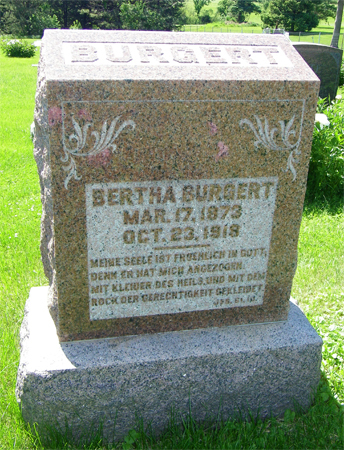 Mrs. Jesse Burgert -- her name was Bertha -- is buried in Salem Cemetery outside of Steinauer. 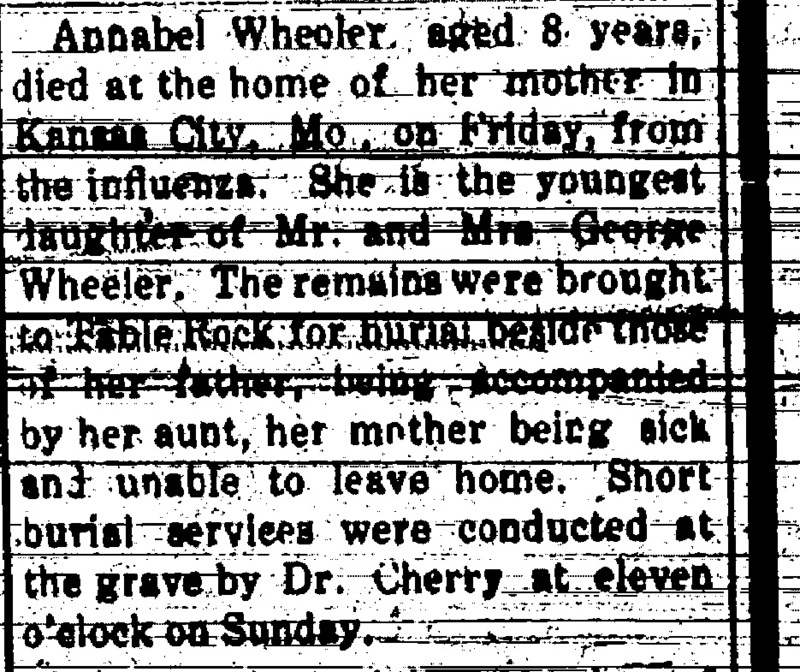 The October 25, 1918 Argus said that the body of C. M. Fisher's daughter Ada was being sent to Table Rock for burial. The burial records do not identify Ada Fisher; either her grave is unmarked or she was buried under a married name. The telegram cited in the article below was misunderstood. 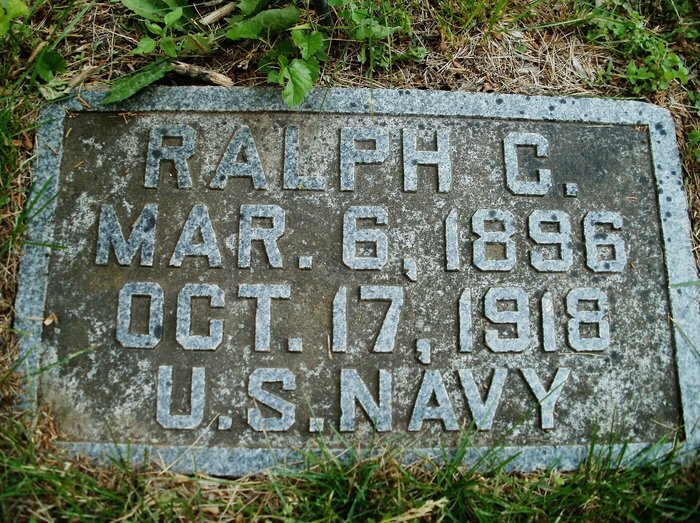 The family was coming from Idaho, but Ralph had died while in the Navy. 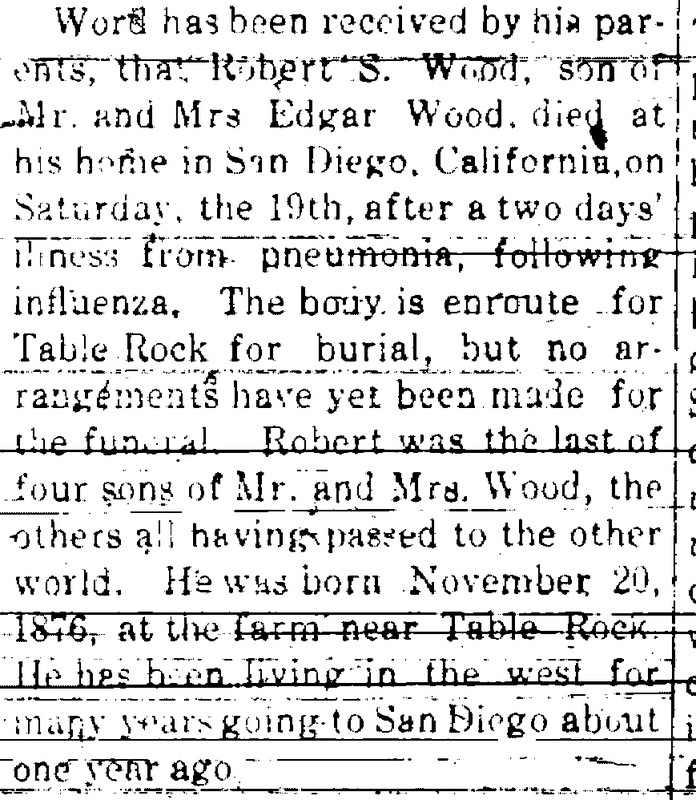 ​Edgar Wood's son robert dies at california home and body brought back to table for for burial. was last of four sons. At right, Julia Zelenka Petrasek (1869-1934). Her husband John went to see their son Frank..
table rock graduate lloyd andrew, going to medical school in philadelphia, writes of the situation there. medical students pulled from school to help treat victims. 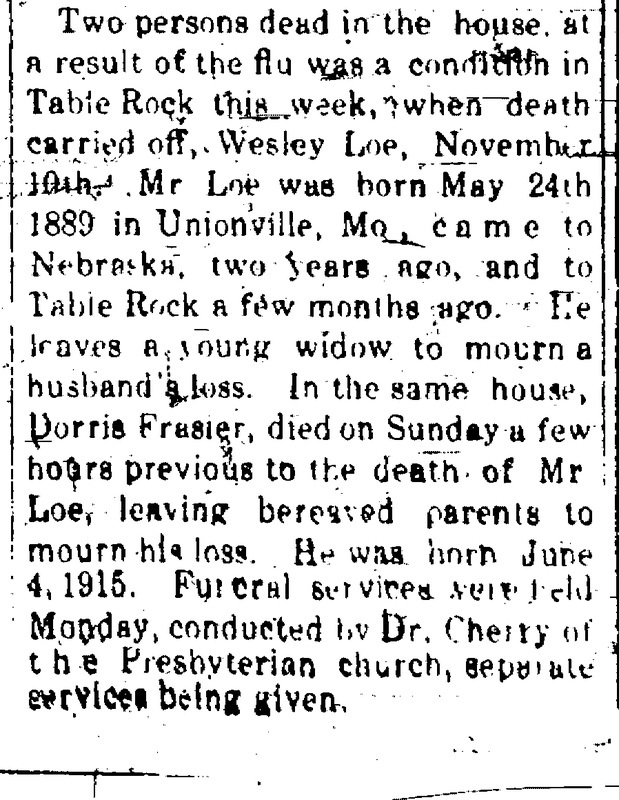 Wesley Loe dies only a few months after coming to Table Rock. He left a young widow, name unstated. Dorris Frasier was a child. Neither of their graves have been found and are probably unmarked. The Christian Church in 1903, 15 years before the epidemic. November 29, 1918: Number of persons ill had increased "to an alarming extent. In some cases, whole families were bedfast, witih no one to look after them. 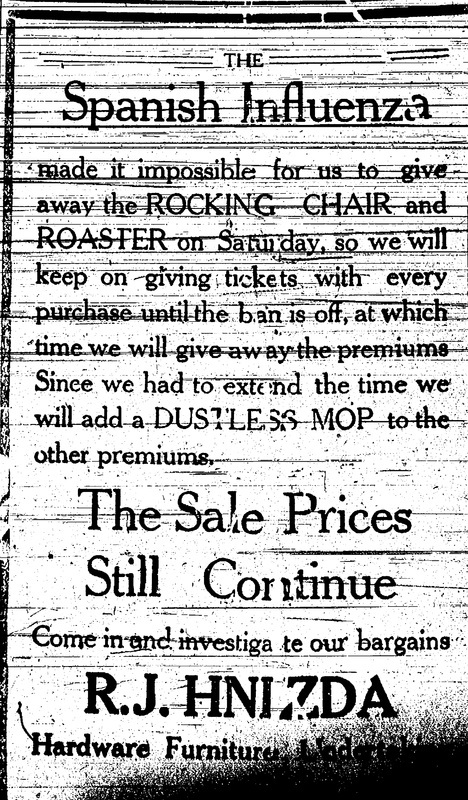 Another ban on public gathrings was placed on "Sunday," a few days before the paper went out, closing places like schools, churches, theaters, and pool halls. The village board asked the ministers to manage care. People encouraged to minimize their time at places like the post office. 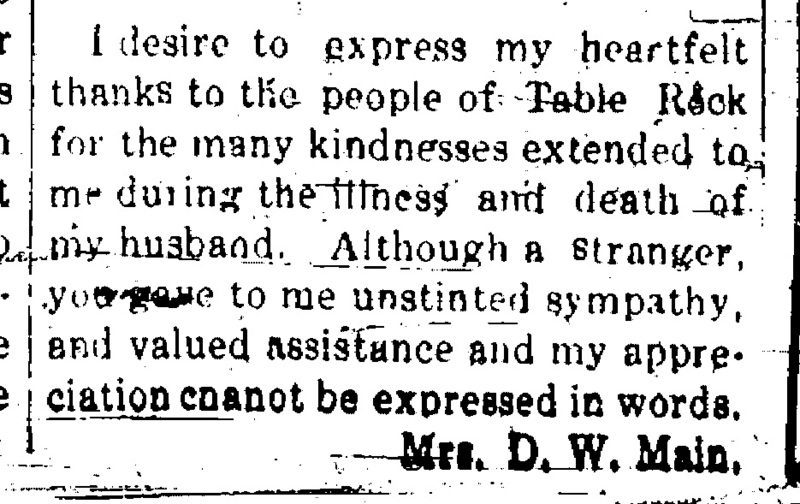 Help was sought to help Dr. McCrea, who had whose "cases has been more than one man can possibly attend to." The hardship of the ban was acknowledged but it was better than bringing sickness and death into the homes. People asked to be "brave, watchful, and careful." Below, Charlie Harlow went on to run an appliance business on the west side of the Square, here in a 1955 ad; the old fire department building stands in its footprint. 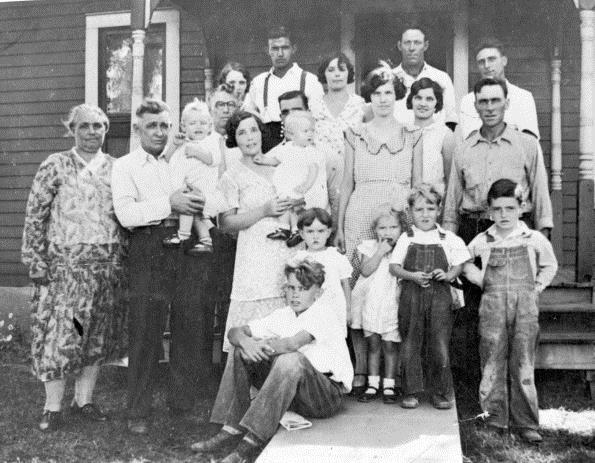 Alvah Norris Aylor, Sr., ("Norris" in the article) is in the white shirt. The picture was taken in about 1922, a few years after his sister Mary died of influenza. She was one of his eight siblings. 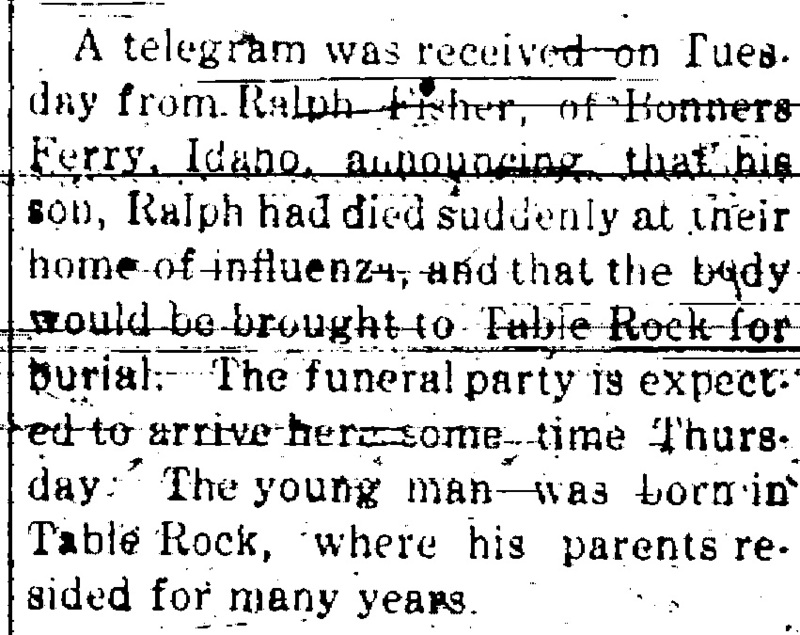 Irene freeman dies, daughter of Harry & lizzie Freeman, "Our darling daughter irene"
Table Rock Argus, Nov. 29, 1918. 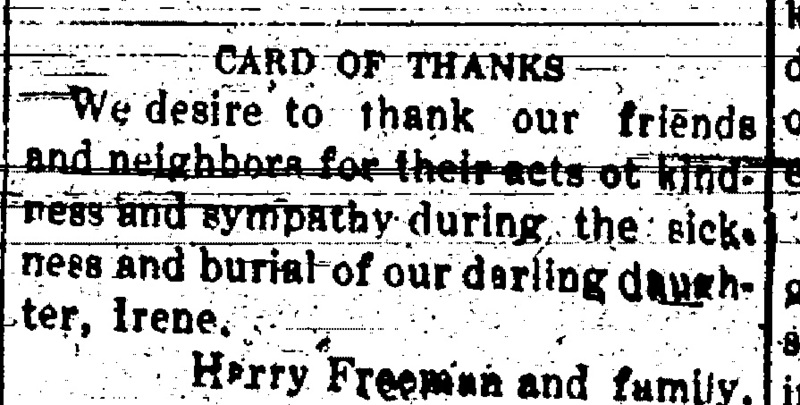 The death of Irene Freeman from influenza, has caused sorrow in the homes of the community, for she was an attractive young lady, loved by all who knew her, and to be called to pass through the valley and shadow of death just when life was unfolding beautiful possibilities for her, causes intense grief to her many friends. Peggy Irene Freeman, daughter of Mr. and Mrs. Harry P. Freeman, was born in Table Rock, February 7, 1898, died November 26, 1918. She leaves to mourn her loss, father, mother, two brothers, Cloyd and Edwin, and one sister Ural. She was a member of the M. E. church having united with that organization, August 25, 1907. 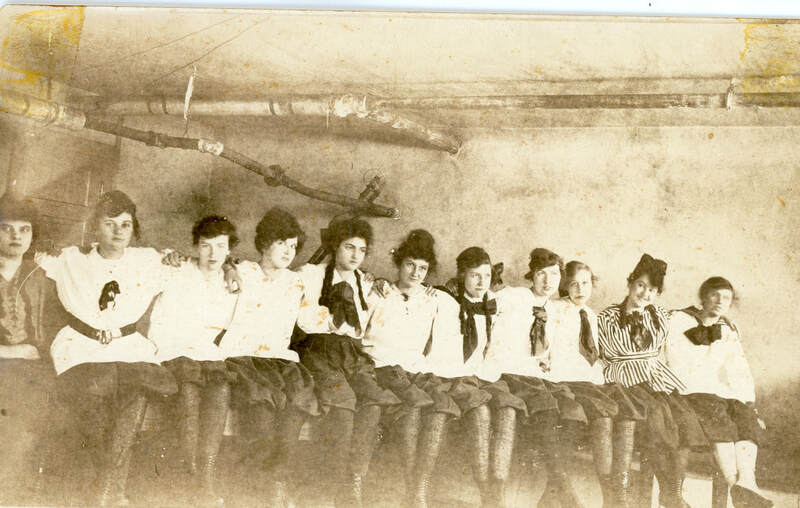 She graduated from the Table Rock public schools with the class of May 31, 1916. When afflicted with the disease she was teaching school near Burchard and was brought home on Wednesday of last week. In the days that followed she grew worse and death came on Tuesday. Funeral services at the grave at 2 o'clock on Thursday afternoon, conducted by Rev. S. E. Taft. To the bereaved parents, brothers and sister, the sympathy of the community goes out in fullest measure. Flu epidemic "the most alarming" situation every experienced in the town's history. There have been about 250 cases in and around Table Rock. The sad and dramatic details of the deaths of Mary Rubis and L. J. Chilin were in the December 27 Argus. They were engaged to be married, and died within hours of each other. Miri Shepherd with his siblings. This photo shared by Ted and Nancy Shepherd Quackenbush does not do him justice. Nancy, daughter of his sister Ruby, says that the family remembered him as a personal young man, a hard worker who was well liked. 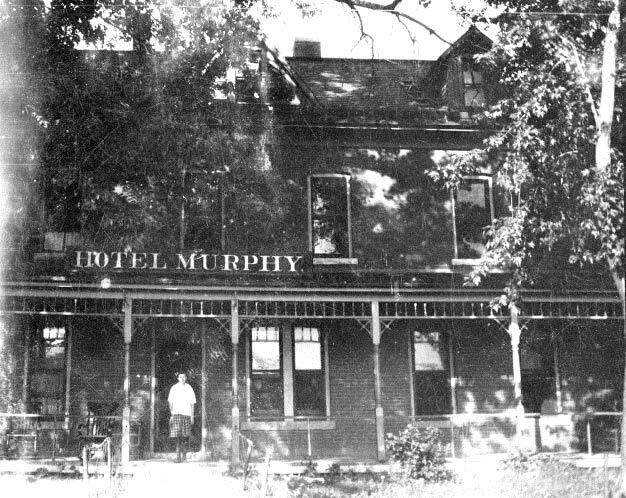 The Hotel Murphy in the 1920s, still run by W. G. Shepherd. The Shepherd family in the 1920s -- without Miri. This photo and the one above was shared by Historical Society member Nancy Quackenbush. mary rubis & lewis chillin die, were to be married a few weeks hence, died within a few hours of each other. 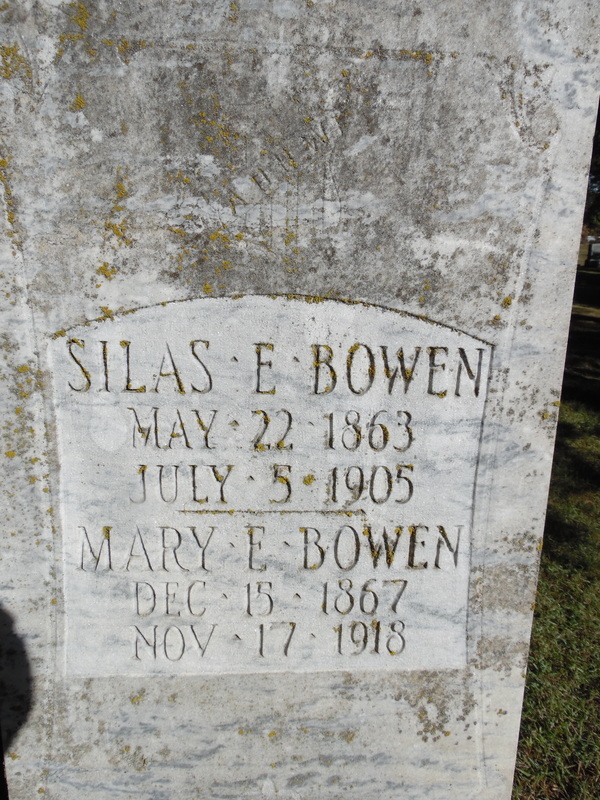 December 27, 1918 -- An engaged couple dies within hours of each other. L. J. Chlin died at the home of Mary Tlustos - he was a railroad worker. His bride to be, Mary R. Rubis died a few hours later -- she was employed at the Murphy Hotel. By the time the newspaper came out with this notice, they would already have been married, had they lived. 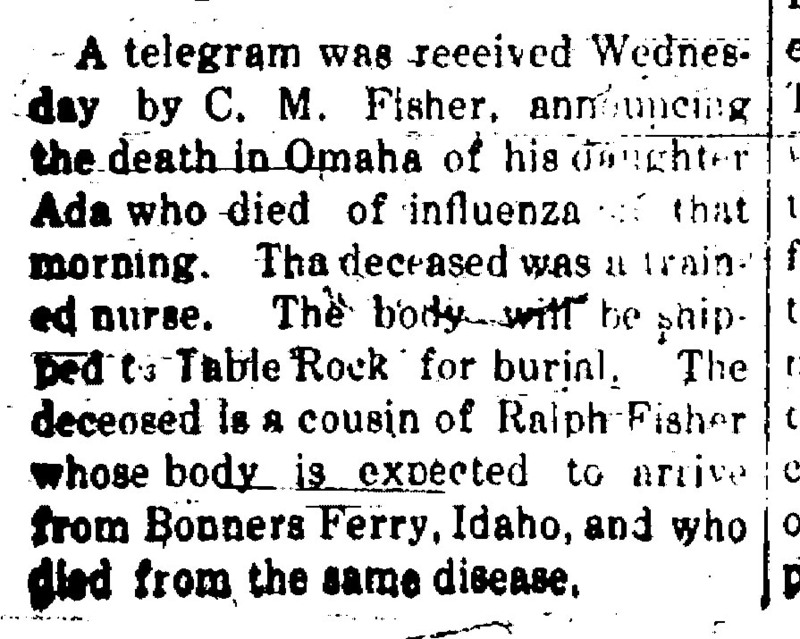 A later edition of the paper says that his family came and took his body back to Denver. Mary is buried in the Table Rock Cemetery. The father of Miss Mary R. Rubis, who died last week at the Murphy hotel, arrived from his Montana (sic) home Thursday evening, and decided to have the burial here, and it was held on Friday, conducted by Dr. Cherry. The young lady had left her home some weeks before expecting to go to Denver, and her parents supposed she was in that city, until they received the announcement of her death here. They do not know why she changed her mind and came to Table Rock instead of going to Denver. The young lady was 18 years of age, and her sudden death causes great grief to her parents. The report of her intended marriage to Mr. Chillin, whose death preceded hers only a few hours, seems well authenticated, and added to the pathos of her death among strangers. Research indicates her parents were Thomas and Anna Rubis, who are buried in Worland, Wyoming. Another victim of the influenza, taken just as life was unfolding to him its wonderful possibilities and opening to him its mighty avenues for usefulness, Bern Talbot was called to take the long, long journey into the world beyond the grave, leaving grief and sorrow to his parents and other relatives and friends. 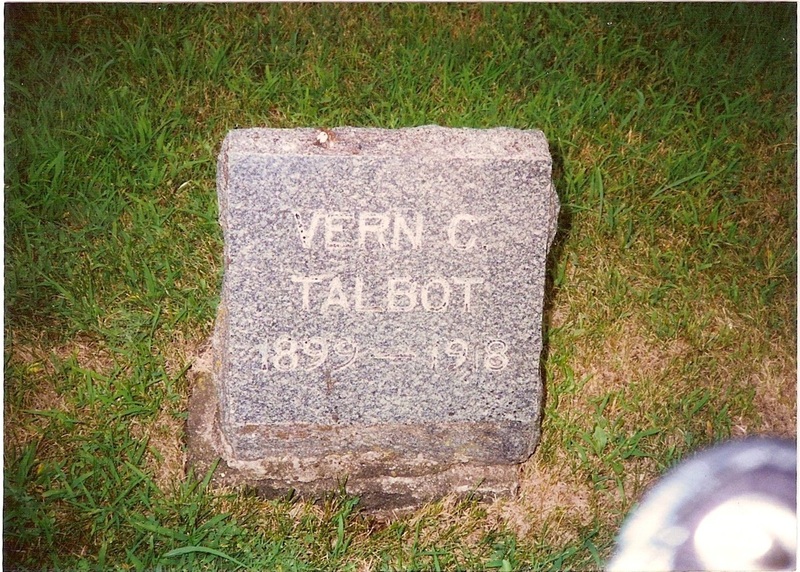 Vern Clayton Talbot, son of Mr. and Mrs. Thomas C. Talbot was born at Table Rock, January 27, 1899. While working for the C. B. & Q railroad company he contracted the influenza and died at his home November 28, 1918, at the age of 19 years, 10 months and 10 days. He leaves to mourn his departure father, mother, one brother, Guy A. Talbot and one sister, Mrs. Joy B. Stover, both of Wilsonville, Nebr., and aged grandparents, besides many friends. 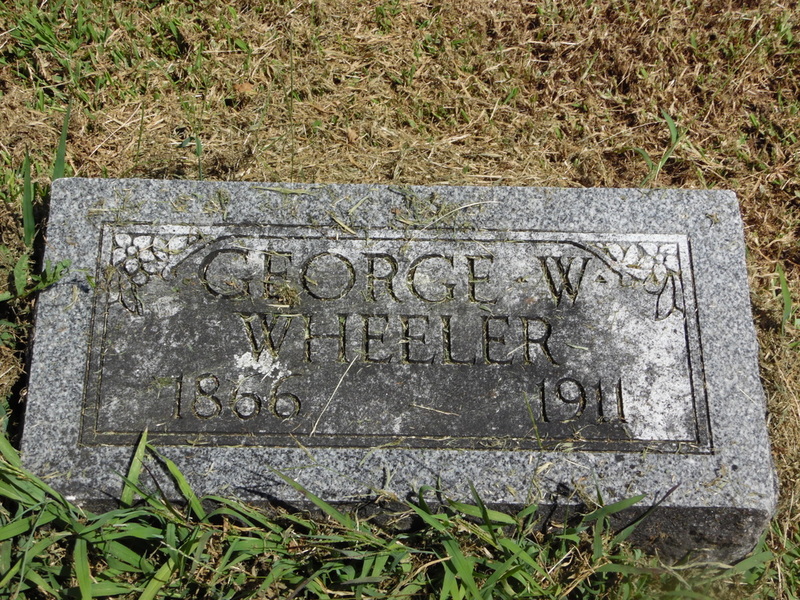 He was a graduate of our schools, class of 1918. He was a member of the M. E. church, having united with that organization February 18, 1917. The funeral services were held at the Table Rock cemetery, on Sunday afternoon at 2 o'clock, a short service also being held at the home, conducted by Rev. S. E. Taft, assisted by Rev. J. B. Cherry. 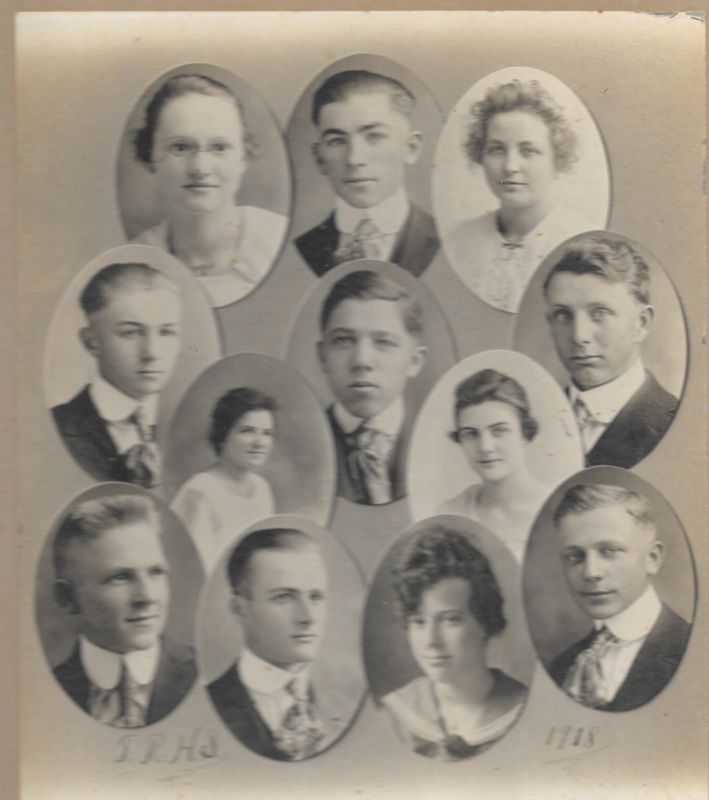 The Class of 1918. Vern Talbot is in the second row, far right. 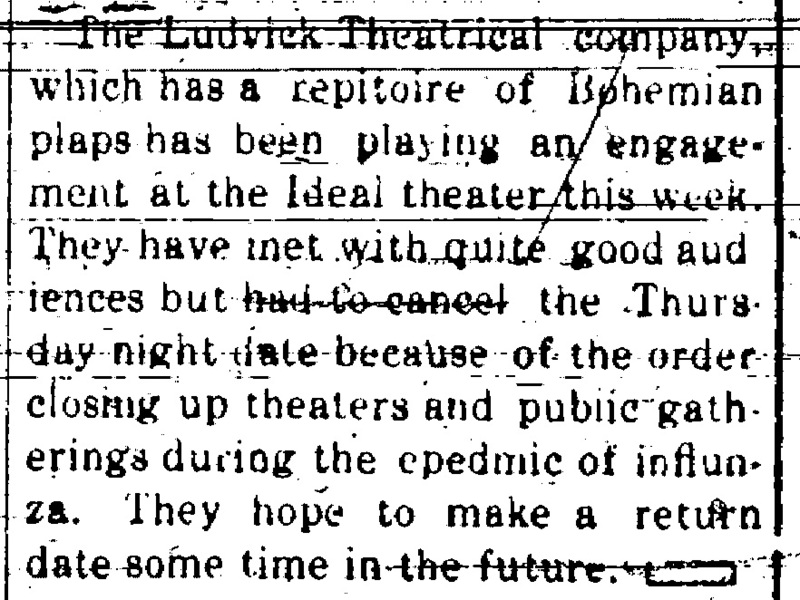 Table Rock Argus, Dec. 6, 1918. 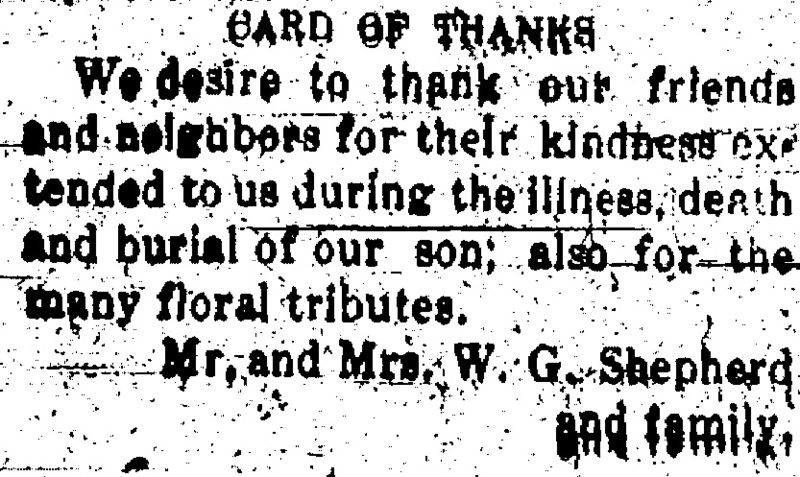 Evert Cordell died at his home in this city on Sunday morning- a victim of Spanish influenza. He had been ill about a week. Warren Evert Cordell was born near Bern, Kansas, February 19, 1879, and died in Table Rock, December 1, 1918, age 39 years, 9 months and 12 days. 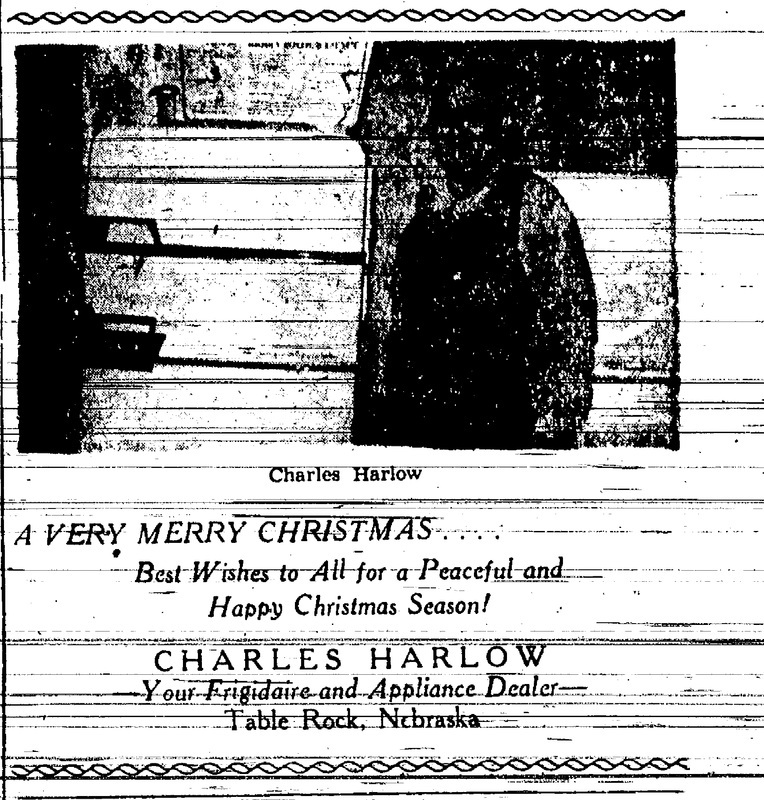 He came to Nebraska in 1898, locating at Dawson, was united in marriage to Miss Myrtle Marshall September 18, 1900; to this union two children were born, Wilma and Velma. They moved to Table Rock last spring, Mr. Cordell being employed at the brick yard. 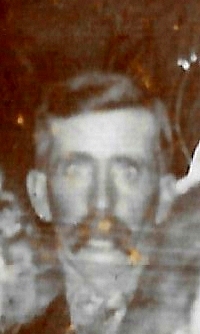 Besides his widow and two daughters he leaves an aged father, W. C. Cordell of Bern, Kansas, four brothers C.G., of Bern, G. B. and B or D.L. of Kansas City, Kansas, H. E. who lives in Colorado and one sister, Mrs. Charles Schober, of Bern. Funeral services were held at the home in the open air, at 2 o'clock Tuesday afternoon, conducted by Dr. Cherry, pastor of the Presbyterian church, assisted by Rev. S. E. Taft of the Methodist church, there also being a short service at the cemetery. The aged father and the two brothers from Kansas City were present at the funeral services. He was a kind and affectionate husband and father, and had a host of friends among those who knew him, and there is sorrow at his sudden taking off in the strength and prime of manhood. The grave of Annabel's father, George. Although Annabel is said to be next to him, there is no stone on the grave next to her father. There are 26 cases of flu in 8 families. City will enforce quarantine provisions. Two provisions emphasized by board of health: If the town doesn't have enough people to enforce quarantine, employ more at the town's expense,"but the quarantine must be enforced." Anyone who violates quarantine rules must be prosecuted -- must report cases within 12 hours, and quarantine begins immediately on discovery of the disease. The ban will be lifted on Monday morning except as to public dances. 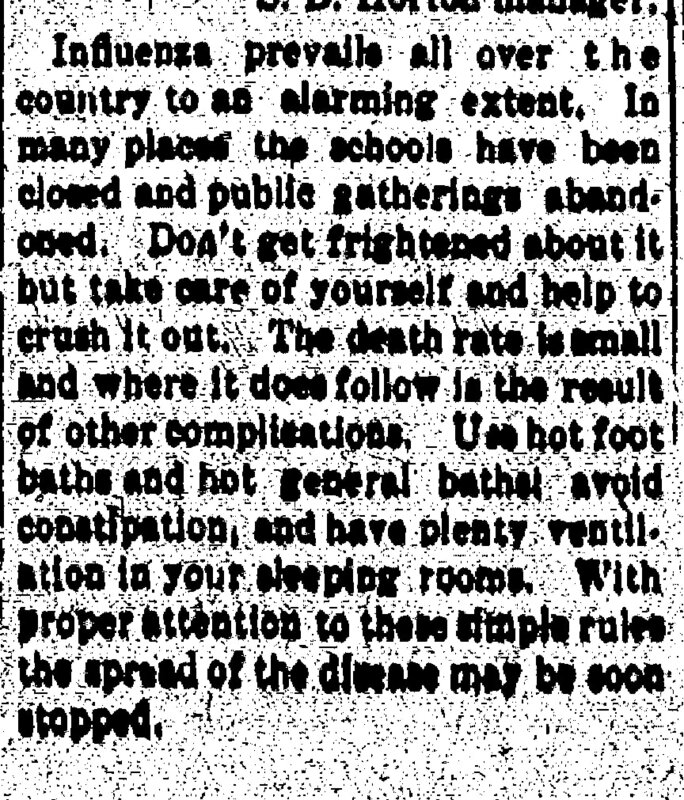 Teachers must exercise care and send pupils home upon any indication of the disease. "Let us all hope that the disease has had its run with us and that we may resume normal conditions very soon." 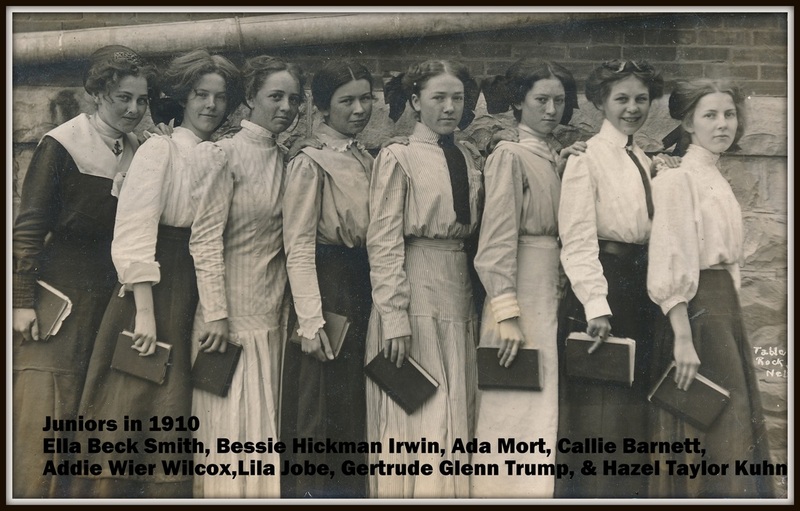 Bessie Hickman Irwin is 2nd from left. Ten years later this lovely girl with smiling eyes would be dead of influenza, leaving a husband and two children. 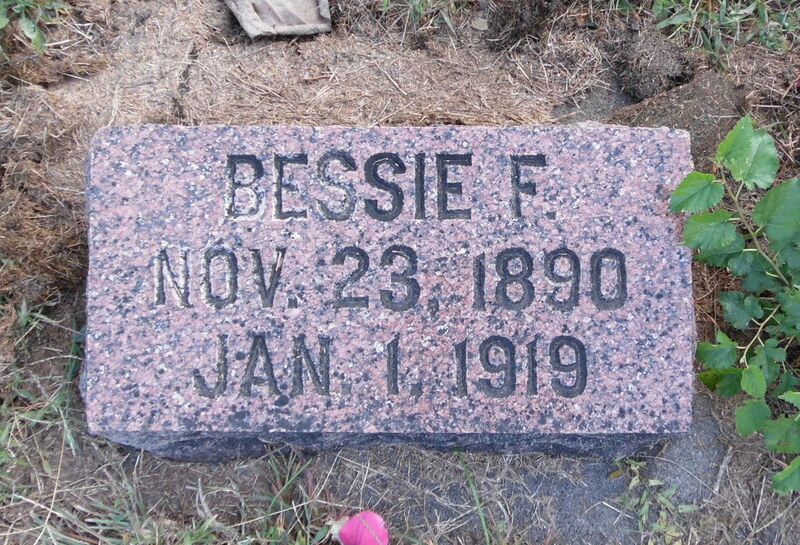 "Mrs. Earl Irwin," her name was Bessie, died. She was only 28. She left a husband and two young children. Others are ill: Earl Irwin. Mr. and Mrs. Frank Hastings, Mrs. J. W. Hastings, Mr. and Mrs. Joe Wopata and their daughter Alice, all being cared for by Bessie Wopata. 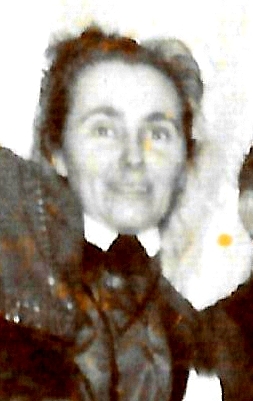 Mrs. C. H. Brock. 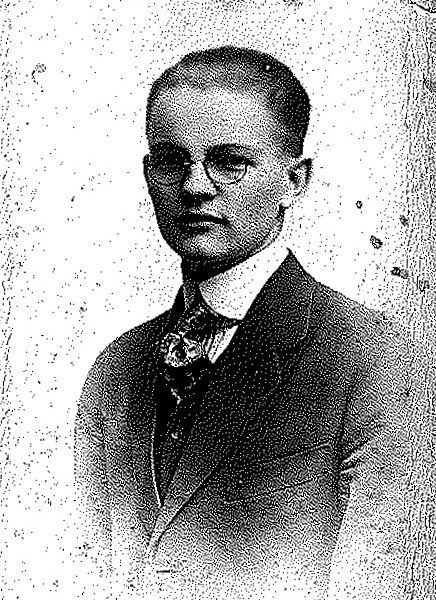 Frank Kovanda. Mrs. Cherry and son Clifford. Ella Skillet, who outlived him by many years. Jasper died in 1948, Ella (also Mary Ellen) in 1960.